Novel applications of dynamic NMR in organic chemistry. Principles and unconventional aspects of NMR diffusometry. Density functional theory and its application to NMR sheilding constants. NMR studies of lac operator lac repressor. Intramolecular interactions of polyethers and polysulphides, investigated by NMR, Ab Initio molecular orbital calculations and the rotational isomeric state scheme. 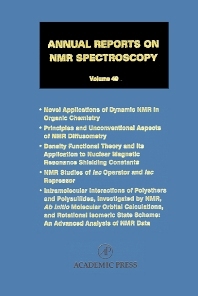 Volume 49 continues the tradition with contributions on: novel applications of dynamic NMR in organic chemistry; principles and unconventional aspects of NMR diffusometry; density functional theory and its application to NMR sheilding constants; NMR studies of lac operator lac repressor; and intramolecular interactions of polyethers and polysulphides, investigated by NMR, Ab Initio molecular orbital calculations and the rotational isomeric state scheme. Chemists, physicists and materials scientists studying properties of solids; those using NMR Spectroscopy. @from:Praise for the Series @qu:"...an eclectic and timely collection of reviews on recent advances and hot topics in nuclear magnetic resonance spectroscopy. ...faithful in citing seminal literature and past reviews, while including most, if not all, recent work in the past 10 years. For those who have an interest in NMR spectroscopy, this book would be an excellent resource." @source:--JOURNAL OF AMERICAN CHEMICAL SOCIETY "All five articles are authoritative and up to date... the volume as a whole maintains the high standard of previous ones in the series, so it gives libraries good reason to continue to invest in subscription." R.K. Harris, Progress in Nuclear Magnetic Resonance Spectroscopy, Article in Press, 2003.